Or view larger version. On the Way to the Summit (The Donner Party). ca. 1891. William Gilbert Gaul, artist. Oil paint on canvas. Collection of the Oakland Museum of California, Kahn Collection. 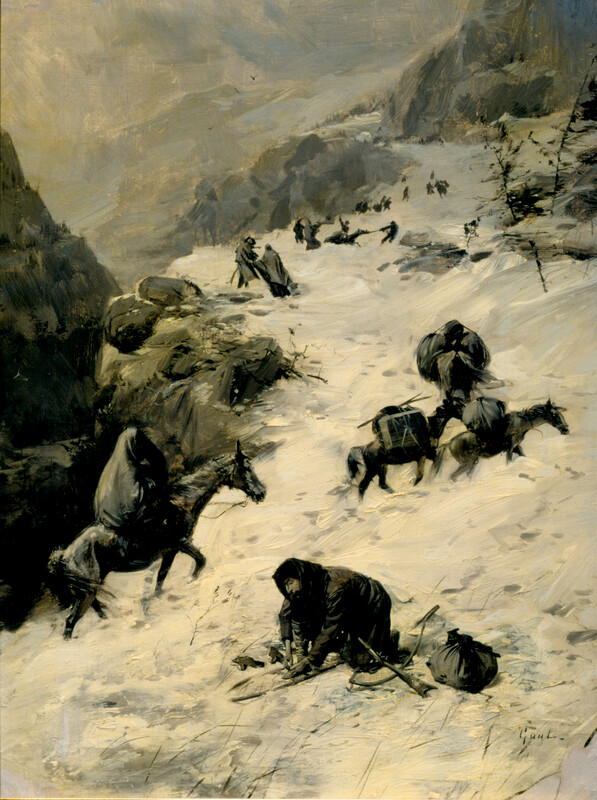 This painting shows the Donner party trudging through the snow of the Sierra Nevada Mountains. The Donner party emigrated from Illinois to California in the spring of 1846. George Donner led the party through a much-advertised shortcut, the Hastings Cutoff. Delays and difficulties caused them to be snowbound in the high Sierras. They faced starvation and extreme suffering, forcing some to resort to eating their dead. Only forty-five of the original seventy-nine survived the journey.